A very easy no-bake cake, that can be prepared in just 30 minutes. 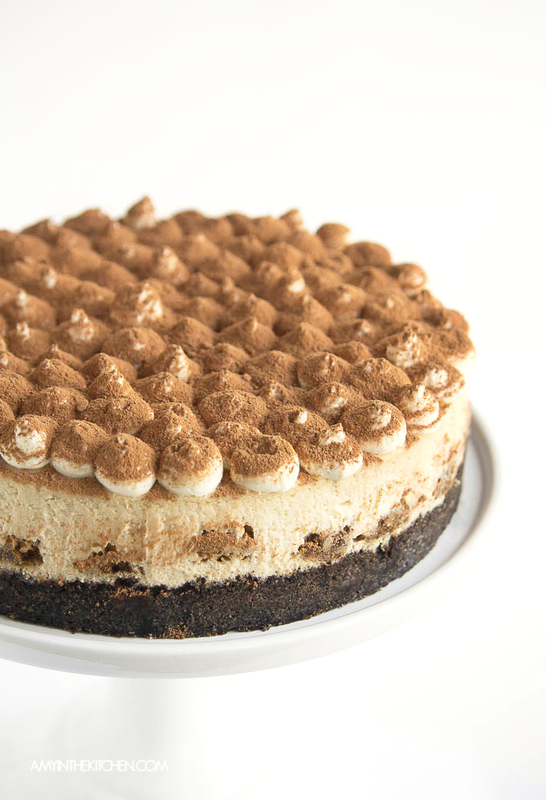 It is a very delicious Tiramisu-flavored cheesecake combines the flavors and richness of tiramisu and NY Cheesecake. This no bake cake can be served during special occasions like birthdays, holidays or anniversaries. Hope you enjoy this recipe! Preheat oven to 350 degrees F (175 degrees C). Place a pan of water on the bottom of the oven. Crush the package of ladyfingers to fine crumbs. Mix the melted butter into the crumbs. Moisten with 2 tablespoons of the coffee liqueur. Press into an 8-inch springform pan. In a large bowl, mix cream cheese, mascarpone, and sugar until very smooth. Add 2 tablespoons coffee liqueur, and mix. Add the eggs and the flour; mix slowly just until smooth. Pour batter over crust in the spring form pan. Place pan on middle rack of oven. Bake until just set, 40 to 45 minutes. Open oven door, and turn off the heat. Leave cake to cool in oven for 20 minutes. Remove from oven, and let it finish cooling, about 30 minutes. Refrigerate for at least 3 hours, or overnight. Grate semisweet chocolate over the top right before serving. And voila! It is ready to serve!